Welcome to another movie review, this time, it’s Woody Allen’s Irrational Man starring Emma Stone and Joaquin Phoenix. Woody Allen started making films in the 1960s and 5 decades later, he is still going strong and I couldn’t be happier about it since I’m a fan of his. True, I haven’t seen all of his films (I don’t think that’s humanly possible), but I love his newer films, which are set in various European cities. 2005’s Match Point and 2006’s Scoop are set in London, 2008’s Vicky Christina Barcelona shows the beauty of one of Spain’s cities, 2010’s You Will Meet a Tall Dark Stranger travels back to the capital of the UK, while Midnight in Paris and To Rome with Love depicts the life of France’s and Italy’s crown jewels respectably. 2013’s Blue Jasmine brings Allen back to the US, where Irrational Man is set as well. If you want to read the review of the previous Allen film – 2014’s Magic in the Moonlight, which set in France during the Inter-War Period – you can find it here. IMDb summary: A tormented philosophy professor finds a will to live when he commits an existential act. Allen is one of a few auteur directors in Hollywood. He has always been famous, but he never went full mainstream and I adore him for that. His films are always quirky, a bit controversial and have a distinct point of view. 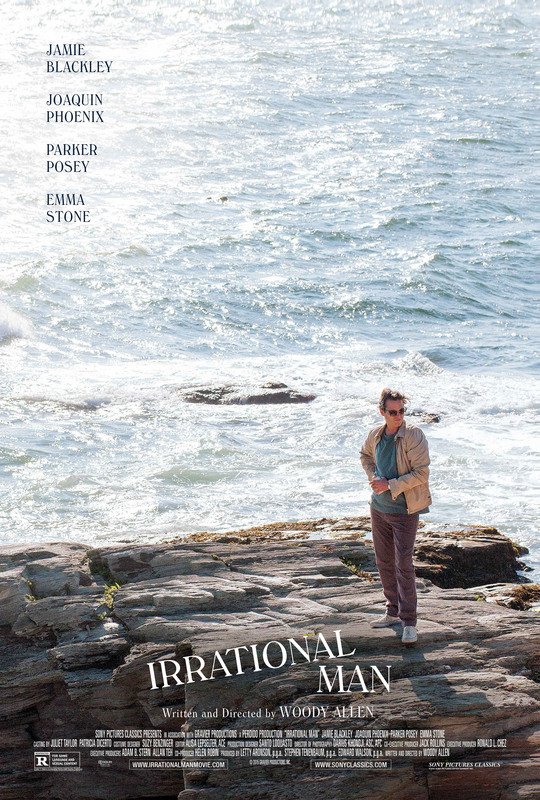 Irrational Man is a story about a depressed man and his journey to redemption. Sadly, the main character chooses wrong weapons for the fight against his own mind. And although his actions might seem inhumane and just plain crazy, Allen makes you understand and even feel pity for this character. I never get so many mixed reactions, when watching an Allen film and that makes it unique. From the visual perspective, the movie looks great. Warm tones and soft colors make the motion picture seem old school, but also turns it into a refreshing break from shiny and metallic blockbusters. Irrational Man is also a pleasure to the ears because the soundtrack is amazing. Happy and upbeat songs mismatch the depressing and quite tragic actions that are happening on screen, but these contrasting opposites complement each other quite nicely. My favorite tracks from the soundtrack are The ‘In’ Crowd by Ramsey Lewis Trio and Over The Waves by Paul Eakins. The main story revolves around two characters – Joaquin Phoenix’s Professor Abe Lucas and his student Jill played by Emma Stone. This isn’t the first time that Emma Stone stars in Woody Allen’s film: they worked on together. In that film and in this one, Emma’s character gets involved with a much older man and, while that may seem creepy or at least controversial in other movies, Woody makes it work somehow. Also, W. Allen is known for sticking with the same actress throughout a few projects (for example, Scarlett Johansson in Scoop, Match Point and Vicki Christina Barcelona), so I’m interested to see if Stone will work with Allen again. She is an amazing actress and I have been a fan of hers since Easy A and I cannot wait to see what she does next,especially after receiving her first Oscar nomination last year for Birdman. Currently, Emma is filming the musical comedy-drama La La Land with Ryan Gosling (they previously teamed up for Crazy Stupid Love). While I can practically name all of Emma Stone’s films, I can’t say the same about her costar Joaquin Phoenix. I loved him in Her and I really want to watch Inherent Vice – his latest film before this one. Moreover, at one point, Phoenix was in talks to play Doctor Strange for Marvel but that role already went to Benedict Cumberbatch, so I’m interested if Joaquin Phoenix can land a different high profile project or is he destined to play in the small leagues and be an awards’ darling, but never a mainstream celebrity. All in all, I adored the latest addition to the already impressive Woody Allen’s filmography. The acting was great and the visual appeal of the film was wonderful as well, while the story was relatable to me personally. Even when I was a kid, I got these existential thoughts before going to sleep. I still remember myself as a 7 years old, lying in bed and thinking why do I exist? On a more upbeat level, the movie has a lot of dialogue lines which are true words of wisdom. I even added one of the quotes from the film – Anxiety is the Dizziness of Freedom – on my mood/inspiration board.